Saturday we had lunch in a restaurant and we did as we always do when a kid sleeps in the stroller. We let them finish their nap outside the café. This made me think of a post from American blogger A Cup of Jo- when she brought this Scandinavian habit up in her blog. Jenny was interviewed and took all the images for this great Cup of Jo post. It is really a great read- an forall the more than 280 comments about it. Comments like “it’s great to let kids sleep” outside to “what a crazy idea” Naturally we always sit so we can see the kids, it’s not like we go shopping for an half hour just leaving them outside. But it is also so interesting what fear do to us. And what different cultures, habits and parenting influences us. So how much do you let you kids run, hang, sleep wild and what are your thoughts about this? First – Oh so good to listen to what you all are thinking! Of course they let the kids and strollers inside moste of the times and the same thing is true for shops – some cafe/restos don’t aloud the strollers simply cause it get too crowded inside but the kids are always welcomed. Since we Swedes walk pretty much everywhere – there are a lot of strollers about. And also we have a very long maternity leave – we get paid from the state to be at home for at least 13 months! So there are a lot of parents around with small kids in strollers. I remember hearing about this years ago on Oprah and thinking it was brilliant that it was a normal practice in some cultures. My kids have always fallen asleep as we walk around, but it’s not a ‘normal’ thing to leave them outside in a public place where I live…so I’ll just leave them to sleep like that at home instead. I have french doors right by where I sit to work so it’s perfect. They really do love it. I’d get into a lot of trouble with the law if I chose to do this in public. My kids sleep when they can, where they can. 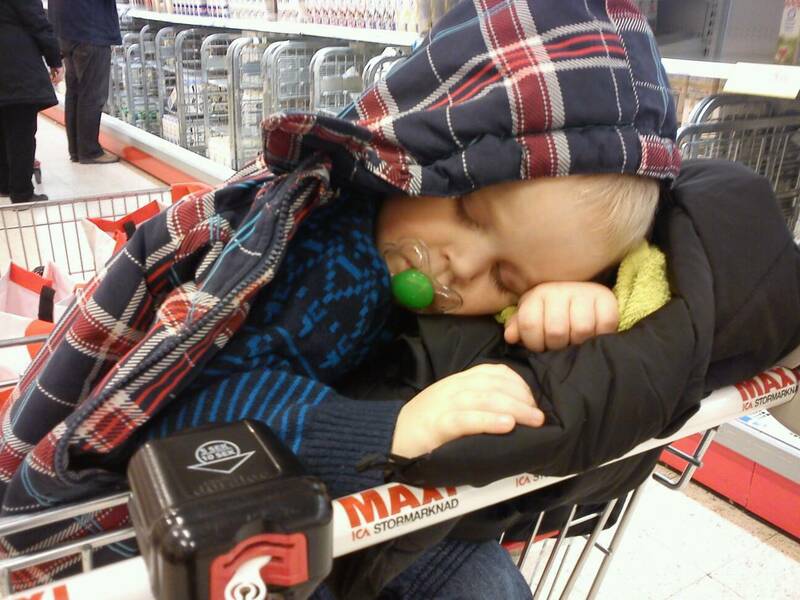 http://lh5.ggpht.com/-dRbBQIhVICI/T1tBwz5ehiI/AAAAAAAAGuM/_qEIrgq2mL4/s0/DSC03148.jpg (youngest son napping while shopping). :-) I’m lucky to be living here where it is OK to leave them sleeping safely outside. Though I’m not so fond of the city (Stockholm) so when they were at that age when sleep was happening for longer periods of time every day I tended to leave them outside a window at home, outside friend’s houses or outside local cafés where we live. We do it all the time, going outside with the children. And we have not only one, but 2 strollers, and two children who sleep a looooooot: the boy, 2 years old, needs 3 hours of nap after lunch and our baby girl, 9 months old, still sleeps 3 times a day! I’m Spanish, married to a Belgian guy, we live in Ghent, Belgium, and we love going to the street, it is in our genes, and we do it a lot, when it rains (and here, believe me, that happens quite often), when it is cold, windy and, yes, sunny. I read the explanation at “A cup of Jo”-blog, but still, it must be cultural, because I’m a bit shocked: why is it that you guys do it? This practice amazes me. Just to be clear, I’m not horrified, only amazed. In Uruguay kids only sleep inside. The exception would be if the kid is going from A to B and falls asleep in between, but once the destination is reached… well, nobody would let him or her “a la intemperie” (outdoors). Unless the weather is over 20ºC, but not even then… it’s just cultural practice I guess. I wonder if this makes people more resilient to cold. The two reasons for leaving them outside is a) it is sometimes so cold outside that they would indeed wake up angry and bathing in sweat if brought inside because of all the clothes we have to put on before bringing them out and b) mainly because so many cafés, restaurants and shops simply do not allow strollers of any kind inside. Definitely, cultural differences, there is so much to learn from the others, fascinating. And WHY don´t you like images of food? I liked the Burgois-image of he wall! Isabelle: I don’t know it’s simply isn’t as good looking at food as eating it. Yes in a lovely cook book maybe but all of you posting food on twitter and instagram – I don’t get it – what schould I do with that info? So interesting, great reading this post and all the comments and the different practices across the world. I live in the UK and I think it used to be a lot more usual to leave babies outside to sleep or sit in their prams and get fresh air. Also you would get left outside shops in a pram or pushchair, mainly because there just wasn’t room inside. Not common now though, there doesn’t seem to be the practise of putting babies outside to sleep. My kids only slept outside if they fell asleep in the buggy/stroller while we were out walking or shopping and then they wouldn’t be left outside. Everyone goes into cafes with buggies. I recon it would be unheard of now to leave your kids outside, certainly in a city.